In addition to managing Pinterest accounts for over 100 clients, I also try to provide simple and actionable steps for those who desire to DIY their Pinterest. One way I do this is by telling you what to pin for every month. I don’t have any insider secrets, but what I do have is a ton of history to look at and learn what has been successful in the past. With that said, let’s take a look at December Pinterest trends! When figuring out what to pin in any given month, your first priority should always be the end-user’s experience. Remember that most people use the platform to find ideas, tips and tricks, projects, and recipes for their everyday life. They may use the pins they find immediately, or they may save them for later. During particular months, users may search for something more than they do in other months. As we head into December, we aren’t talking about pinning bathing suits,(unless you are headed out on a lovely vacation!) We aren’t talking about barbecues or Easter baskets or handmade Valentines. We are talking about the things that people are searching for in December. Our goal as content creators is to deliver the right content at the right time. You need to give your reader what they are looking for when they are looking for it. Christmas — We can’t talk about pinning in December without talking about Christmas. From decorations to recipes, tablescapes to gifts, kids activities to trees, December 25th is the biggest day this month. You need to think through what type of content your reader comes to you for. Do they come to you for crafts? DIY? Recipes? How can you incorporate Christmas into your content? Other December Holidays — Christmas is not the only December holiday. Hanukkah and Kwanzaa are also celebrated during this month. If you don’t have anything specific to these holidays, you could create a board for “Kwanzaa crafts for kids” or something like that. Maybe you have some ideas for Hanukkah recipes or games for the holiday. Share those. Go into your content and update your posts to include any affiliate links and links to other posts that are relevant. Be sure to also include a place for your readers to sign up for your email list. Holiday Fashion — If you are a fashion or lifestyle blogger, December has no lack of topics you can take advantage of to gain readers and show up in search. Think of all the formal wear that is purchased in December for holiday parties. Help your readers by recommending the perfect little black dress. Go one step further and do a whole outfit; dress, shoes, makeup, and hair. Be sure to use your affiliate links to all of the things you tell them about. Engagements — December is a time when many couples get engaged. Think of all the needs there! Are you a wedding or engagement photographer? How about sharing content on engagement parties? Not only do people get engaged in December, but a lot of people get married this month (and in January as well). Posts like “Last Minute Tips for Your Winter Wedding” do really well. Just don’t wait until the last minute to pin them. Get them out there in plenty of time for them to show up. Cocktails — While cocktail recipes are huge year round, they really leap to the top in search during the month of December. If you have some creative cocktail recipes, now is the time to be pinning those. They do really well right up until 10 p.m. on December 31st. New Year’s Eve — Believe it or not, people are already preparing now for New Year’s Eve. Readers are planning their parties, the dress they want to wear, activities for the kids, crafts to make with their kids, games, food, etc. Take a look at your analytics to see what did well for you last year. If you didn’t blog last year during the month of December, take some time now to figure out what types of content your audience would want from you. This is personal to your niche. For example, I am not blogging about cocktails, parties, or creating crafts with my kids here on the Simple Pin blog. What I am thinking about though is what my audience is going to want from me when the new year comes and they are amped up for moving their blog and business forward. I need to be preparing now to tell them what worked in 2017 and what I see coming for 2018. December is unusual in the sense that as soon as December 25th is over, there is a massive shift in what people are searching for. The searches move towards healthy eating, budgeting, and productivity. You need to be positioning yourself now to grab this group of people who want to hit the ground running in 2018. They are already setting goals. That’s another topic you could cover during December — goal setting. Goals for Pinterest marketing, how to set business financial goals, etc. Any of those would be popular because people are looking for them as early as December 26th and they remain huge all the way through mid-February. December is a heavy travel season as people go to their families to celebrate or take vacations to warm, sunny locations. Why not provide your readers with guides on making the travel easier? We talk a lot about gift guides here, but you can provide many kinds of guides that aren’t gift based. Something like “6 Ways to Keep the Kids Entertained on a Long Car Trip” is a great way to provide value to your reader. Whatever your industry or niche is, you have information that is helpful to your audience. You can create guides for any topic or niche. Talk about the things that you find most helpful and be sure to include those affiliate links to increase your income. One important thing to remember is that you need to pin in advance of when people will be searching on the topic. As soon as Christmas is over, people will start searching for organization and decluttering tips. While pinning about decluttering in December can feel weird, you need to do it so that it shows up in search when Pinterest users start looking for it. Seeing pins show up in the smart feed can take some time, depending on what the user searches for, so you need to allow a bit of time for your pins to show up. Always remember that Pinterest is a long game, so prepare in advance. Let me recap really quickly what the smart feed is for those of you who aren’t familiar with it. Each Pinterest user has their own smart feed, which is based on their interactions with others, their searches, and what they’ve saved to their own boards. Prior to the smart feed, Pinterest had a chronological feed, so you would literally see pins as the people you followed pinned them. You knew when someone was expecting a new baby because they were pinning a ton of baby stuff. Pinterest decided to give each user a feed that was specifically curated for them. Let’s take my feed for instance. I have followed many different people on Pinterest with various niches and interests. I won’t see everything that they pin until Pinterest determines I want to see them, based on my searches and other interactions. If I do a search for a knitting project and someone I follow has a relevant pin, I may not see that pin for a week or more in my smart feed. That’s why it’s crucial to get your content out there early and often. 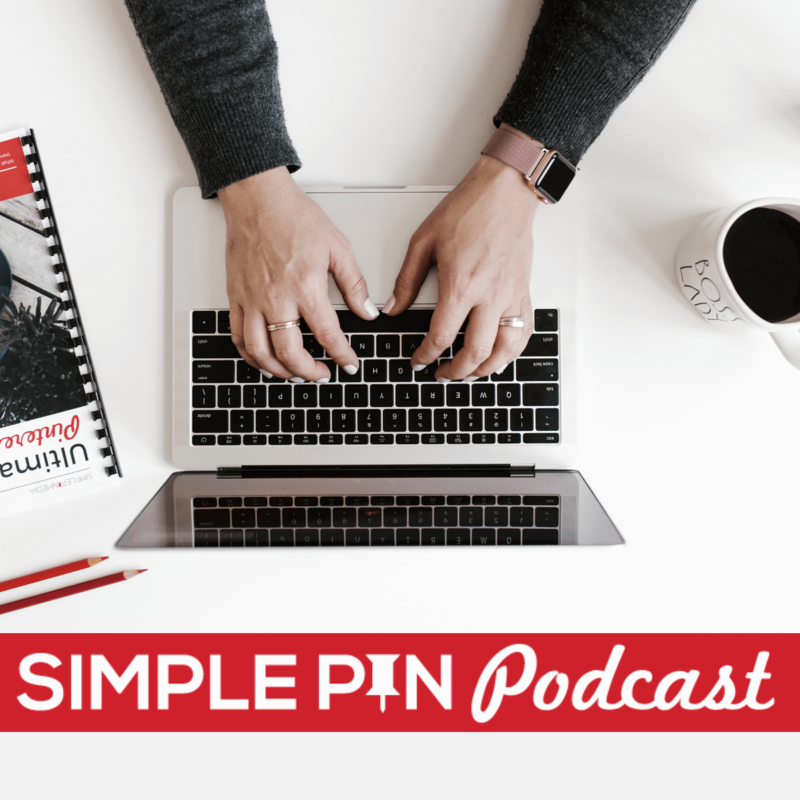 One way to get more of your pins into the smart feed is to get your audience to pin your content for you. When you create new content, give your audience an easy way to pin it. If you send out an email newsletter, include a link to it and tell your reader to pin it for later. Include a Pin-It button on your site. You want Pinterest to take note of the number of times your content is being shared so they will view it as a valuable pin and include it in the smart feed. For each month of the year, there are certain pins that you will want to promote. For this month, they run along the same topics we have talked about in this episode. Run your promoted pins for about three weeks to get the best results. Leave your boards alone. Pinterest has made moving boards a frustrating experience, so don’t even worry about trying to get those holiday boards to the top. Instead, grab the URL for those boards and share it with your audience through email, your blog, or social media. Acquisition —> All Traffic —> Referrals. Click on Pinterest.com and it will give you a list of all the pins and traffic for your site. Change the date range to January 1, 2017, and hit Apply to the date. There will be a graph at the top of the page. Take note of your trends. Which months were higher for you? Which were lower? What were your top three pins for the year? This gives you an idea of what to expect for the coming year as far as traffic, but it also helps you see which kinds of content you need to create more of. I love the end of the year for many reasons, but one of my favorites is seeing what worked well for me and what I need to improve in the coming year. I hope these monthly episodes have been helpful for you all. Please let me know in the comments if so, and how we can serve you for the rest of 2017 and into 2018. The goodness of using Pinterest for business is that a new blogger or Internet marketer does it need previous experience to make the best of using the world’s most popular pinning Network, now known as a search engine like Bing, Google, and Yahoo. People from all walks of life can create a free Pinterest account, join multiple affiliate Networks, include a link to their affiliate landing page or affiliate link directly, and write a natural description in the Pinterest pin section. The natural description left in the area where the person is supposed to write something will get picked up by search engines and indexed. As a result, the Pinterest pinner can see a positive spike in affiliate sales, or an increase in traffic to their blog or website if they left a link to their domain name in the URL section of the pin. Anyone any time of the year can post anything they want to their Pinterest account with the intention of increasing their affiliate sales 365 days a year. One thing I personally like about Pinterest is that you can not only earn a full-time living from using the network to build up traffic to your site or affiliate links, but it’s also free of charge to use. There’s nothing wrong with using sites like Etsy or Poshmark to promote your affiliate links or sell things directly out of your house or from consignment shops. I personally love using Pinterest because not only can you post affiliate links directly or links pointing to your blog or website to improve your SEO – search engine optimization, but people can embed your pins on their blogs and websites so that you’re content with affiliate links or links posting to your site can receive additional exposure. This results in free advertising from others and bedding your content on their sites, positively resulting in increased web traffic and sales from whatever you’ve posted. therefore I am goingg to convey her.